It was Friday, July 10, 1925, 9 :00 a.m., in the small rural community of Dayton, Tennessee. The State of Tennessee v. John Thomas Scopes should have been open-and-shut: did high school teacher Scopes teach evolution in class? If so, he was guilty of violating a new Tennessee law. But the case ballooned into a media event that revealed a widening chasm in American Christianity. In January 1925 the Tennessee legislature passed a bill that made it unlawful “to teach any theory that denies the story of the Divine Creation of man as taught in the Bible, and to teach instead that man has descended from a lower order of animals.” Any teacher found guilty of the misdemeanor would be fined between $100 and $500. Consequently, the bill created a national buzz. Immediately the American Civil Liberties Union (ACLU) advertised to pay the costs of testing the statute in court. A mining engineer in Dayton convinced John Scopes (1900–1970), a science teacher and coach who had filled in briefly for the ill biology teacher, to become a test case. Nationally known lawyer Clarence Darrow (1857–1938) joined the defense team and William Jennings Bryan (1860–1925) the prosecution of the made-for-radio trial (the first to be broadcast nationwide). Both men were in the twilight of their careers. Darrow, 69, was widely known as a defender of “radicals” and an outspoken agnostic. Bryan, 66, had been a three-time presidential candidate and secretary of state under Woodrow Wilson. A leading spokesman for the emerging movement called “fundamentalism,” he had not practiced law in more than 30 years and now wrote a syndicated weekly column on the Bible. When the trial began, over 100 journalists—including the sardonic H. L. Mencken—descended on tiny Dayton. Each side, aware of the media circus, played not only to a jury but also to a nation at attention. On day one of the trial, people crammed into the courtroom, far exceeding the number of seats. In its opening statements, the defense argued that the trial represented not a conflict between secular humanists and Christians, but between tolerant, educated Christians and intolerant, backward-looking Christians. Darrow quipped, “There is some doubt about that, but that is what he said, is it?” (Laughter). After less than four hours, the prosecution rested. The defense wanted to argue that evolution was universally accepted among scientists and that it was not a contradiction for Christians to subscribe to the theory. So it brought in experts from world-class universities who, in many cases, were also Christians. “Amen,” shouted voices in the audience. “The facts are simple,” Bryan concluded, “the case is plain, and if those gentlemen want to enter upon a larger field of educational work on the subject of evolution, let us get through with this case and then convene a mock court, for it will deserve the title ‘mock court’ if its purpose is to banish from the hearts of the people the Word of God as revealed.” The courtroom swayed with applause. Judge Raulston eventually allowed expert scientific testimony, but only in affidavits read into the court record. The jury would never see or hear it, but it might come into play in the inevitable appeal. They also read a statement from Tennessee Episcopal priest Walter C. Whitaker: “As one who for 30 years has preached Jesus Christ as the Son of God and as ‘the express image of the Father,’ I am unable to see any contradiction between evolution and Christianity.” They added similar statements from other theologians and scientists. Then, in what proved to be the most effective strategy of the trial for the defense, defense attorney Arthur Hays called Bryan as an expert witness. Hays wanted to weaken the prosecution’s case by making its star attorney look foolish. Over the objections of his own team members, Bryan took the stand. “Do you think about things you do think about?” snapped Darrow. “Well, sometimes.” The court rippled with laughter. But Darrow would not rest: “Would you say that the earth was only 4,000 years old? “Do you think the earth was made in six days? Other commentators criticized Darrow for his bad behavior at the trial, and the ACLU wanted to drop him from the appeal team. But Scopes insisted on keeping him. In time, and due in part to Inherit the Wind’s influence, it would be the attacks on Bryan and on small-town America that held America’s cultural attention. Darrow would come to symbolize clear-headed modernity at its finest; Bryan to represent tendentious Christianity at its worst. The truth was more complex than that. Knowing the trial was a lost cause, Darrow on the eighth and final day asked the judge: “I think to save time we will ask the Court to . . . instruct the jury to find the defendant guilty.” After only eight minutes of deliberation, the jury did so. The judge fined Scopes $100. David Goetz is an author and the former editor of Leadership Journal. 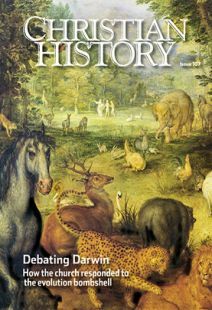 This article is abridged and adapted from Christian History 55: The Monkey Trial and the Rise of Fundamentalism.